The UVic Wind Symphony, conducted by Steven Capaldo is joined by guests the Naden Band of the Royal Canadian Navy for the concert “Something Old, Something New…” This is the sixth annual collaboration of these two outstanding ensembles—a partnership that is unique in Canada. This concert presents a modern twist on the traditional approach to concert programming of an overture, a symphony, a march and a concerto. 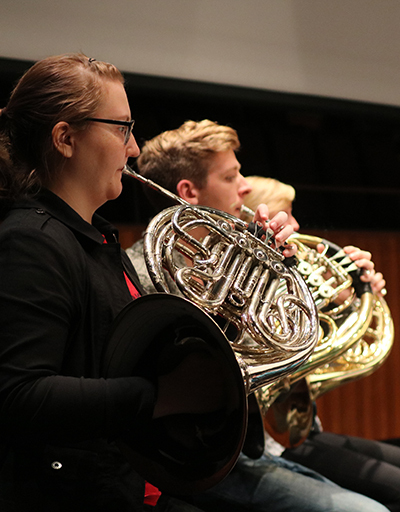 The program features new and classic works for wind ensemble including Copland, Persichetti, Jager and Bryant, as well as UVic student Jason Gordon playing Gillingham’s Concerto for Euphonium, Winds & Percussion. Want to know more about the program? Come to the pre-concert talk in Senate Chambers (University Centre) at 7pm with conductors Steven Capaldo, CPO 2 Brayden Wise and PO 1 Ben Van Slyke. Tickets complimentary for UVic students with a valid ONECard. Reserve in advance or at the door. Special rates available for groups including elementary, middle and high school students (and their guardians). Contact the UVic Ticket Centre for details.